The Power Haus produces all the energy it needs—and more. After Net Zero: The Negative Energy HomeThe Power Haus produces all the energy it needs—and more. Net-zero energy homes may be the hot new thing at the moment, but Josh Wynne Construction has already begun looking—and building—past that. The builder’s recent project, the Power Haus, in Sarasota, Fla., not only offers high-style design while producing all the energy needed to run the home, but also doubles as an energy production plant in its own right, producing extra power to feed back into the grid. To create all that power, the home is outfitted with solar panels that provide electricity to the home and heat water for both indoor use and the pool. But more than just using clean energy sources, the design also harks back to the fundamental notion of efficiency by focusing on simply consuming less. “We looked at everything that consumes power in the house and tried to reduce its load so that we could reduce the number of solar panels we needed to use as well,” says Drew Smith, president of Two Trails, a green building consulting firm that collaborated with Josh Wynne on the project. To that end, the home is outfitted exclusively with LED lights, a highly efficient air-conditioning system and pool pump, and super-insulated windows. Concrete block walls feature extruded polystyrene on the living side of the wall, as well as spray foam insulation injected into the cavities of the block. As a result, the home’s HERS rating of -22 is the lowest ever recorded by Energy Star, and its LEED score came in at 118—far beyond the necessary 95 for a Platinum certification. The home also uses passive ventilation, passive cooling, and passive lighting, which both take down energy use and help open the home up to panoramic views of the surrounding hardwood swamp. Good looks notwithstanding, the site came with its own set of challenges thanks to its hot, humid climate. In response, the home sports finishes that can take the heat, such as polished concrete floors, clay walls over mold-resistant drywall, and native cypress timbers for doors, trim, cabinets, and roof framing. Claire Easley is a senior editor at Builder. What is Green Building? Green building, or sustainable design, is the practice of increasing the efficiency with which buildings and their sites use energy, water, and materials, and reducing building impacts on human health and the environment over the entire life cycle of the building. Green building concepts extend beyond the walls of buildings and can include site planning, community and land use planning issues as well. Why is Green Building important? The growth and development of our communities has a large impact on our natural environment. The manufacturing, design, construction, and operation of the buildings in which we live and work are responsible for the consumption of many of our natural resources. This is the second article in the five-part 360Value Green Building Article Series. The goal of the series is to inform insurance professionals about the growing green building trend and how it may affect insurers in the future. The 360Value team has a comprehensive understanding of green building techniques and is actively studying this emerging issue to define more clearly how best to incorporate the various green building options into 360Value. In this article, “What Is Green Building and Why Is It Important?” we will expand on the definition of green building and discuss its growing role in the construction industry. The phrase “green building” is everywhere. Builders, property owners, realtors, bankers, insurers, and lawyers are latching on to the term and using it in the context of their respective professions. But does everyone who talks about green building really understand what it means? The simplest definition of green building is to build in a way that minimizes environmental impact and creates a healthy indoor environment for occupants. As energy prices continue to climb and more people become aware of their personal impact on the environment, green building has moved from the fringe to the mainstream of the construction industry. It has become a trend that will affect builders, property owners, and insurers for years to come. Insurance and other professional service providers are already responding to the popularity of green building. Some insurers offer green-upgrade insurance, where homeowners pay an additional 2 to 3 percent premium on top of their regular homeowners insurance to cover the added expense of rebuilding green in the event of a loss. Other insurance products cover specific green aspects of a home, such as on-site electricity production. Those policies address gray areas within the green building movement, such as where responsibility lies for failure to attain a specified green rating (such as LEED certification) or if a building doesn’t perform as expected. Most traditional liability policies would not cover those issues, so some insurers offer green liability coverage. One of the predominant reasons green building confuses some people is because it can apply to so many different construction techniques and materials. One objective of green building is to provide occupants with clean air to breathe, while minimizing resources consumed by the building during its construction and lifetime. This means a green building may be as simple as building a conventional house using best practices and positioning it to take advantage of the sun. Or it could be a structure built from alternative or recycled materials. It could have all of its energy needs met by alternative sources, such as wind turbines and solar panels, or it could use an oil-fired heating system but have a living roof. There is no single characteristic or material that definitively categorizes a building as green. Many common building materials either contain substances harmful to human health or release such substances during their manufacture. A large part of green building focuses on finding natural or less harmful alternatives, such as plywood made without formaldehyde-based glues, natural fiber-based insulation instead of fiberglass, or bamboo-based products in place of tropical hardwoods. Another significant element of green building centers on energy use, both in the manufacture of building materials and in the lifespan of the structure. That typically means using better insulation, minimizing the quantity of materials used, and choosing materials with low embodied energy (the energy required to produce and deliver the product) or with a high lifetime-to-embodied-energy ratio. Although green building is becoming a specialty in the construction industry, many traditional builders might be surprised to learn that the best practices they already use are considered green. For example, carefully installing insulation to prevent drafts and cold spots, installing proper flashing around openings and penetrations, and implementing moisture-management techniques all fall under the umbrella of green building. All these best-use techniques challenge the misperception that green building costs more than traditional building. Many structures can contain green building materials and attributes but may not technically qualify as green. That is where formal green certification comes into the picture. The two most widely accepted standards in the United States are the U.S. Green Building Council’s LEED system and the National Association of Home Builders National Green Building Program. Both standards provide a green ranking based on the materials and methods used in planning and building the structure. Proponents of the certifications argue that, when a building attains a certified level of “green,” it can attract tenants, increase rental or resale values, and provide a more productive space for occupants. The concept of green building is constantly evolving. To appreciate its effect on the construction and insurance industries, one must combine a general understanding of the concept with more details on new green building materials and labor techniques, green building certifications, and various green building trends for commercial and residential properties. It wasn’t easy to pull together state-by-state facts and figures about the strength of our growing green building marketplace. But we did it, thanks to the help and support of all 77 chapters. * We now have at our fingertips—state-by-state and region-by-region—an impressive collection of some of the countless, market-moving highlights of our 50-star studded flag under one green building nation. Solar power is coming back to the White House. The citizens of Detroit are rebuilding their community one block at a time. Thousands of people across the world will commit service to green schools this month. Industry-wide discussion and a common vision have brought a new version of LEED that is set to propel us forward. 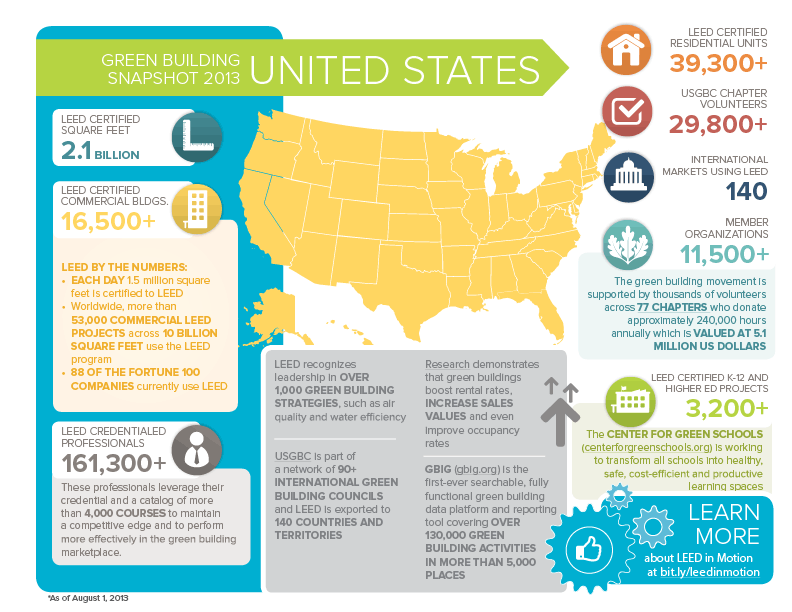 4.3 million people live and work in LEED buildings—a number of them are historic too. Real estate researchers are uncovering long-awaited proof of higher value for LEED-rated properties. LEED is exported to 140 countries, and LEED Earth will take it further. Certified projects are doubling down on their commitments and recertifying, while compliance forms are becoming easier to use. Public policy is enabling greater opportunity, too. We know the facts—#LEEDworks! So, while we do now have “50 States, 50 Stories,” we now also have a far bigger story of our national green building impact that is far bigger than the sum of its parts. Be a part of it in Philadelphia this November when we celebrate Greenbuild Nation! The U.S. infographic is attached to the end of each state market brief. Find your state here: AL, AK, AZ, AR, CA, CO, CT, DE, FL, GA, HI, ID, IL, IN, IA, KS, KY, LA, ME, MD, MA, MI, MN, MS, MO, MT, NE, NV, NH, NJ, NM, NY, NC, ND, OH, OK, OR, PA, RI, SC, SD, TN, TX, UT, VT, VA, WA, WV, WI, and WY. In addition, you can read about each of our chapter regions and their priorities to transform the market towards more sustainable buildings and communities: Heartland, Upper Northeast, Northeast, Southeast, Florida-Caribbean, South Central, West, and Pacific. *Special thanks to Alison Yue, Advocacy Associate, who executed the lion’s share of the work during her 1 year tenure here at USGBC. Alison’s last day was Friday, August 30. We wish her well! We’ve seen plenty of impressive net zero houses in the past, from the motion-controlled CHIP House in California to the budget-priced Sosoljip in South Korea. But one issue that seems predominant in most energy-neutral homes is that they typically take on a design that doesn’t suit many suburban areas. That may soon change though with the first Active House, which uses natural lighting and ventilation to reduce its energy consumption while still blending in with the architecture of the surrounding neighborhood. The Active House is a prototype home sponsored by VELUX, a Danish company that designs products to encourage the use of natural lighting, particularly skylights and windows. The project was created to promote buildings that have a positive impact on the environment while providing a healthy and comfortable indoor climate for occupants. A handful of other prototype Active Houses following these same standards have also been constructed all over Europe. Project leaders chose Webster Grove, a suburb of St. Louis, Missouri, as the building site for it’s first U.S. construction project because it’s an area that receives all climate extremes, from ice-cold winters to sweltering hot summers. If the house proves to be energy efficient in this location, the theory goes, it should work just as well in any other location in the United States. Natural lighting features heavily in the Active House, with windows, skylights, and sun tunnels scattered throughout every room. The interior design also features mostly light-colored surfaces, openly-connected rooms, and glass partitions to make sure whole house can be clearly lit on most days. Electricity and hot water are mostly provided by solar power as well, though a natural gas system does act as a backup when needed. Maintaining a comfortable temperature also plays a large part in conserving energy, which is why the Active House’s construction centers around natural ventilation and improved insulation. Windows that open are arranged in a straight path upwards, while the rest of the house is sealed airtight, maximizing the flow of fresh air inside. The outside walls also incorporate insulated panels and double-paned windows to reduce the amount of heat transfer, and the roof is covered in solar-reflective tiles to deflect sunlight and heat. Best of all, most of the windows and blinds are rigged to an automated system to control the amount of heat, light, and fresh air that enters the home. Residents can even program them to open and close at certain times of the day, month, or even year, ensuring they’re using natural energy as much as possible. The house does still have heating and air conditioning equipment as well – all rated for high energy efficiency of course – but the house’s temperature-regulating construction should ensure they aren’t used as much. Finally, the majority of the building materials are recyclable, and some were repurposed from a previous structure on the same site. Altogether, the Active House simultaneously meets or exceeds the requirements for the ANSI-700 National Green Building Standard, Energy Star, Builder’s Challenge, and Indoor Air and Water Sense Programs, among others. Even with all its sustainable technology and architecture, it was very important to the designers that the Active House blend in perfectly with the surrounding neighborhood. The aesthetics of many net zero homes are usually influenced by energy efficiency above all else, which may lead to some unique designs, but also means they have to be constructed outside of a typical residential area. By constructing a house that fits in almost seamlessly with local architecture, the project leaders hope more areas will open up to the idea of incorporating net zero practices in future housing projects. For all it’s green innovations though, what good is a house without someone living there? The Smith family – consisting of David, Thuy, and their daughter, Cameron – contacted the Active House project leaders when they decided to build a new home and worked closely with the designers on its layout. After almost a year of construction, they finally moved into their new home in late 2012 and will allow the University of Missouri’s Midwest Energy Efficiency Research Consortium to collect data on the house’s energy usage during their first year there. Net-zero homes need clear labeling to attract homebuyers and an instruction manual for when they are sold, according to NIST. Though this looks like a typical suburban home, it is actually a net-zero test home in which robots simulate the activities of a four-person family. Scientists monitor performance from the garage. Keeping size in check, incorporating passive solar techniques, and building a tight, well-insulated envelope are listed as high-priority design strategies for net-zero-energy homes, according to a new report from the National Institute of Standards and Technology (NIST). Strategies to Achieve Net-Zero-Energy Homes: A Framework for Future Guidelines is based on the input of experts from a workshop NIST held in 2011. Acknowledging that homeowners are not widely investing in net-zero homes, the report recommends factoring the cost of energy into home financing as well as offering homeowners consolidated information sources. It says a new, consistent labeling system for multiple consumer preferences—including energy efficiency, durability, indoor air quality, and accessibility—is needed. The report lists some available resources relevant to creating a comprehensive home scoring system, although, as Allison Bailes of Green Building Advisor observes, it oddly excludes the Home Energy Rating System (HERS) Index. Even though HERS does not cover all the categories the NIST report asserts a rating system should include, it has become an established platform to compare energy performance, and its scale accommodates net-zero buildings. The report also delves into issues with technology, builders, and occupants. More efficient systems are needed (examples in the report focus on HVAC), but builders are sometimes wary of introducing unproven technologies, and occupants sometimes behave in ways that do not maximize efficiency capabilities (see Want a Net-Zero Home? Be a Net-Zero Family.) To fill in the knowledge gaps, NIST has sponsored a $2.5 million test facility to study the performance of a net-zero home by running real appliances, such as televisions and toasters, as if a family of four were living in the house. Small devices, programmed by NIST scientists, replicate the heat and humidity occupants would produce in the 4,000 square foot house. Every move of the virtual family has been scripted—down to the 14-year-old daughter taking longer showers. The information will be used to understand how human behavior affects energy performance and to create guidelines for owners of net-zero-energy homes. After a year, the facility will be used to test new technologies. Two foresight specialists describe how tomorrow’s integrated, networked, and aware home systems may change your family life. In the last decade, a range of digital technologies and services have hit the market and moved quickly from niche use to the mainstream. Consider that just seven years after being founded, Facebook is used by more than 50% of the online population in the United States and India, and much higher percentages in global markets from Chile to South Africa to Indonesia. And flat-panel TVs, e-readers, smartphones, and even augmented-reality apps—all largely missing from the consumer landscape just a few years ago—continue to be eagerly adopted even in the face of economic uncertainty. As we look toward the next decade, it’s clear that we are in for even more dramatic changes in the roles that technology will play in daily life. But what technologies are poised to move from niche toward the mainstream in the next 10 years? And how will these technologies change everyday activities? To bring this into sharper focus, Innovaro Inc.’s futures consulting group identified 10 key themes that it feels will help define the tech experience in the coming decade. These 10 “technology trajectories” will give people a powerful new “toolkit”—new devices, services, and capabilities—that will forever alter the way that we go about everyday activities, from dating and shopping to learning and working. This glimpse of Innovaro’s 10 Technology Trajectories presents several forecasts for how these new capabilities could reshape family and home life in the next decade. And although these themes were identified with the United States and other advanced economies in mind, the Technology Trajectories have global potential to reshape life in emerging economies as they’re adopted and explored there as well. 1. Adaptive Environments. Advances in materials will make the home and work environment “smart.” Everyday objects, surfaces, and coatings will gain the ability to adapt to changing conditions or people’s needs—e.g., becoming self-cleaning, self-insulating, or protective. The built environment will no longer be simply structural and passive; it will become adaptive, functional, and smart. 2. Cloud Intelligence. The cloud will evolve from being a static repository of data into an active resource that people rely on throughout their daily lives. With new capabilities for accessing online expert systems and applications, we’ll tap into information, analysis, and contextual advice in more integrated ways. Virtual agents will migrate from being an automated form of phone-based customer service to a personalized form of support and assistance that provides information and—more importantly—performs useful tasks. For example, such agents might design a weekly menu based on a family’s health profile, fitness goals, and eating preferences, and automatically order ingredients. 3. Collaboration Economy. The power of collective intelligence will enable us to accomplish cognitive tasks not easily handled by virtual agents and machines in the cloud. We’ll get advice and recommendations and solve problems by tapping into the social graph, and this cognitive outsourcing will be applied to both business issues and personal and lifestyle questions (e.g., “Which diet will work best for me?”). 4. Contextual Reality. People will navigate through their daily activities thanks to multiple layers of real-time and location-specific information. This contextual overlay for everyday life will give us a new way to see our surroundings and provide new forms of decision support. We will move from a world where information and connections are hidden to one where real-time, contextual information generates ambient awareness. 5. Cutting the Cable. Personal devices will be largely untethered from wired power and data connections. Access to the Internet will be ubiquitous, and the tech infrastructure—from electronics to sensors to cars—will be powered by a more diverse set of technologies, including micro-generation, wireless power transmission, and advanced power storage. We will move beyond plugging in, and even beyond the “plug and play” model, to a world where data, power, and inter-networking are ubiquitous. 6. Information Fusion. It will become possible for people to generate useful insights about their own habits and behaviors by fusing personal data (e.g., social media profiles, tweets, location data, purchasing histories, health sensor data). But these insights will only be as good as a user’s ability to understand and act on them. Personal data will become comprehensible through visualization and other services. 7. Interface Anywhere, Any Way. Intuitive interfaces will become the dominant form of interaction with personal electronics and computing devices. We’ll be freed from the rigidity of conventional input devices (e.g., keyboard, mouse, screen, remotes) and able to interact with the digital world anywhere—and any way—using a combination of gesture, touch, verbal commands, and targeted use of traditional interfaces. 8. Manufacturing 3.0. Manufacturing will be reconceived—from a far-flung, global activity to more of a human-scale and re-localized endeavor. As consumers continue to call for both personalization and attention to environmental pressures, demand will grow for a more local manufacturing infrastructure where product schematics in certain categories are digitized and distributed to commercial fabbing services (or in-home 3-D printers) for final fabrication. 9. Personal Analytics. Data analytics will increasingly become a consumer tool as much as a business tool. This will open up analytics to a wide variety of personal and lifestyle applications. We’ll collect, store, interpret, and apply the vast amounts of data being created by and about ourselves during our everyday activities. 10. Socially Networked Stuff. Many of our possessions will interact with each other and with the broader digital infrastructure. This will create a world of socially networked stuff, where things can actively sense, communicate, and share data. Rather than owning a fragmented set of possessions and devices, passively sitting next to each other, we’ll manage a dynamic ecosystem of belongings that interact and work in concert for our benefit. So, how will the new capabilities described in the 10 Technology Trajectories change home and family life? What will our homes look and feel like? How will they support our activities and lifestyles? Technology is not the only driver at play here, and the Technology Trajectories are not emerging in a vacuum. There are numerous social, generational, and values drivers at play as well. Of the many drivers that our team at Innovaro considered while generating these forecasts, we especially noted the impact of digital natives on adoption of technology in the home, shifting demographics, and economic considerations. The maturing of the digital natives. Digital natives—people who have grown up never knowing a world without the Internet, smartphones, Facebook, etc.—have far different attitudes toward technology than do older generations. There are now two distinct generations of digital natives in the United States: millennials (born 1979–1998) and Gen Z (born 1999 and after). The technology behaviors of these groups will affect adoption of technologies that impact family and home life in coming years, as more millennials become parents and as members of Gen Z hit their tween (10–12) and teen years. Shifting demography. Delayed marriage and parenthood is shrinking family size. At the same time, the strong connection between millennials and their baby-boomer parents has led to a rise in multigenerational households in the United States, a trend that has been further intensified by the Great Recession. The changes in the form and function of the home will happen within the larger context of these continued demographic shifts. Digital DIY. Digital natives grew up in a world where building, modifying, and hacking consumer technology is taken for granted (think MAKE magazine and sites like Instructables and even YouTube). The participatory and DIY proclivities of younger generations could drive a move to more customizable home technology and help weave advanced technologies deeply into home life. New family dynamics. Social media and mobile devices are altering family relationships. Studies have found high ratios of Americans saying Internet use has reduced time spent with family members. Conversely, technologies can increase family connectedness over distance—e.g., by enabling nearly continuous parental oversight via Facebook or weekly Skype conversations with far-flung relatives. Constrained family finances. It’s likely that families’ heightened focus on value will persist for years to come. Some people will invest only in home technologies that either directly save money or offer exceptionally compelling new functionality or experience, such as immersive entertainment systems. A two-tier market could emerge in which well-off families adopt smart-home technology while less-well-off households stick to twentieth-century-style home systems. In the decade ahead, a confluence of these sorts of social factors with the Technology Trajectories will begin to change the very nature and function of homes, give family members new roles, and further alter family dynamics. Homes and home systems could become far more aware, adaptive, and responsive to their residents. New interfaces, for instance, will make home technology more ubiquitous, as flexible displays finally reach commercialization. Nearly any home surface could become a touchscreen, providing fingertip control of home electronics, as well as access to “cloud intelligence.” Interfaces will also be more intuitive, with voice control, eye-tracking, and even emotion analysis that monitors facial expressions to help determine what the user wants. For example, a house or apartment might monitor you walking through the door at the end of the day and look for clues on how to best serve your needs. It might remotely sense body temperature or interpret body language; compare these with past arrivals, known schedule for the day, etc. ; and “know” if you were likely returning from a workout at the gym or a 15-hour workday. With this information, the system might adjust lights, music, and temperature in the house or display different information based on cues that it picked up from you. It might automatically pull up exercise tracking stats and healthy recipes after a workout, or carry-out food options when it senses that you might have just worked overtime. While this future may sound far-off, vending kiosks in Japan are already using sensors to detect age, gender, and emotional state in order to offer shoppers a more targeted selection of products. New materials and power technologies may also change the way homes look and feel. LED wall coatings will change colors or designs to match the season or holiday—or show a movie or ballgame during dinner. A wave of the hand might turn any part of a kitchen counter into an induction cook top. Counters could also be self-sterilizing, using ultraviolet light, and have built-in touch-screen controls. And advances in short-range wireless electricity transmission may eliminate plugs and cords entirely for our electronic devices. This intense need for a connected lifestyle will shape the kinds of home products that kids—and their parents—buy, and younger family members will become the de facto DIY mavens for their households: staying current on new technologies, knowing how to customize them, and guiding family purchases. Digital natives of 2020 could be the family experts at customizing household technology—just as in the 2000s they were the social networking experts, with parents often asking their kids to help them set up Facebook pages. Digital natives may also drive greater personalization of the home. They have grown up with the ability to personalize the look of their Wii character, cobble together personal media feeds, and express themselves visually on sites like Pinterest. Based on the control they’ve grown accustomed to in the digital world, they may expect to customize and modify their families’ home systems to a greater degree than previous generations. This could be especially true of entertainment systems, but could also apply to adaptive walls or other smart infrastructures in the home. Much of the demand for virtual products—i.e., digital possessions that exist locally on their devices or in the cloud—will be from digital natives as well. It will be increasingly possible to render the artifacts of our digital lives in the real world, and millennials could be big adopters of 3-D printing. People may print household and hobby items they design or modify themselves. Imagine, for example, a crafter taking a 3-D scan of a sea shell, modifying the shape and texture using design software, and then 3-D printing her digital creation as a piece of art or jewelry. Already, a prototype 3-D printer called Origo is being developed for the tween market. Children who grow up with toys like Origo will be proficient in the technology—and as young adults in 2020, they may expect to be able to fabricate things at home to personalize and customize their home environment. The Technology Trajectories outlined above will alter the home and its physical artifacts, as well as the families that adopt them. These family and home environment alterations may have repercussions well beyond the household into daily life and society at large. Living in “glass houses.” Levels of transparency in the home will rise. Home systems and processes that have been opaque to homeowners, such as energy consumption or the off-gassing of paint, will become transparent. For people who are interested in the “quantified self” movement, smart homes will make it easier to measure and track one’s own behavior. For example, your home could help record and analyze your activities to uncover insights about your behavior over time—e.g., that you tend to argue with your spouse more on days that you don’t exercise, or that you sleep poorly when you eat dinner after 8 p.m.
House layouts will change. Houses will change to accommodate the new technologies and the behaviors they enable. As the need for wired power and data access falls away—and new interfaces emerge—more-flexible home designs may come into vogue. Rather than dedicated media rooms or home offices, spaces may be more flexible and adaptive; residents may be able to work or play in any room that suits their preferences. Homes could become even more central to daily life. Homes will be more personalized, responsive, and attuned to residents’ preferences. As this becomes the case, people may find that the experiences that they have in their homes will be superior to what they can have in public spaces for certain activities. For example, productivity levels working at home in a space personalized for one’s physical, mood/emotional, and practical needs will likely exceed what can be achieved with a rented desk at the local telecommuting space. Homes could become the preferred location for core activities such as work, education, and entertainment. People could become more dependent on their homes and home systems. Creating new divisions. With so much more control available over home devices and systems, issues of who controls what will go far beyond tugs-of-war over the remote. Being granted access to or control over certain home systems—such as refrigerator-mediated food ordering or immersive multimedia systems—could become a new rite of passage for younger family members, just as getting your own set of house keys has been in the past. Family impacts could have pros and cons. With all of these new capabilities at hand, home life could be more engaging, convenient, and fun. On the flip side, learning curves could be steep, especially for generations who are not digital natives. To sidestep this problem, some families may simply outsource management of these next-generation home systems—creating a new business opportunity. Others, feeling stressed out by tech complexity and the prospect of another monthly bill, may choose to opt out. A new digital divide? Cost will be an issue, and not all families will be able to afford emerging home technologies. Whereas the digital divide used to be about access to PCs and broadband Internet, in the future it could be about access to adaptive and aware living spaces. A final outcome of these changes is that the market for advanced home technology will grow much larger, more complex, and more competitive than today. Rather than having a few key technology nodes in the home (e.g., PC, tablet, Internet-enabled TV, and smartphones), all key home systems might well become networked devices—from water and electric meters to electrochromic windows. This will open up myriad opportunities for new home products and the potential for exciting collaborations across previously unrelated industries—from consumer electronics and computing to home furnishing, décor, and home improvement. As the Technology Trajectories are realized, tomorrow’s families could be far more connected with each other and with their communities than ever before. And when you call home, your home will answer. Chris Carbone is a director with Innovaro’s foresight group, where he oversees the Global Lifestyles and Technology Foresight projects and contributes to the firm’s custom futures research projects. Email chris.carbone@innovaro.com. Kristin Nauth is a founding partner of Foresight Alliance and has 15 years of experience as a foresight professional, including six with Innovaro. Follow her on Twitter, @knauth2015. This article draws from Innovaro’s Global Lifestyles Research Series; visit www.innovaro.com for details. Innovaro, The Innovation Solutions Company, provides the intelligence, software, and consulting services that companies need to innovate and grow. Innovaro’s foresight group operates two subscription-based futures research services: Global Lifestyles and Technology Foresight. It also conducts custom trend and futures research projects for a wide range of corporate and government clients. You are ready and packed to leave on a holiday trip and for the first time, you agreed that your teenage son can stay home alone. The control freak in you is already making long lists of daily and weekly tasks and to-do’s to keep the pets and plants alive, and the calamity predictor in you wants to anticipate for flooded bathrooms and burning fryers. Is it really wise to leave this kid alone in the house? The Real Smart Home becomes your ally as you will carry your portable home dashboard with you, across the world as you travel. A Real Smart Home is a home where the rooms are continuously monitored via sensors for usage and evaluated for security, comfort and convenience. This evaluation takes place “in the cloud” and enables the home owner to control and monitor the various systems throughout the home from any web connected device, anywhere in the world. This includes arming the house if no one is home and turning on a light if your son is entering the garage. If a window gets left open, the system is smart to turn off the air conditioning or heating in that room to ensure no power gets wasted. You even may be able to remotely close and lock the window, or at least send a text to your teenagers and get them to do it. That is the real Smart Home, which will help us to improve security, comfort and convenience while reducing energy costs. But indeed there is much more, and as we will be able to write our own mobile apps, based on a diverse cornucopia of sensors in and around the house, the applications you need are only limited by your own imagination. You want your son to get up in the morning? An occupancy sensor in his bed will tell you when he’s still asleep, or even better, when he came to bed the night before. You can control the alarm and the blinds in his bedroom to make sure he’s awake early. To make sure he eats, you want the fridge to hold healthy food. Every time your son takes something out, the barcode is scanned and listed in the online grocery store. Your approval and adding a couple of frozen pizzas is all you need to make sure the groceries get delivered and your son is not starving. The cat’s water bowl has a level sensor that will prompt a reminder to your son’s mobile phone and the plants and lawn have a moisture sensor that does the same. This app is linked to the weather station and will only sprinkle the lawn when no rain is predicted. No more withered houseplants or sunburnt lawn at your return. And the cat will not have to eat at the neighbor’s house. Your curbside mailbox is equipped with an accelerometer or a position sensor that will transmit a when the postman drops off the mail.It can even text your child a gentle reminder if he does not empty the mailbox the same day. But let’s stay realistic. Your son will throw a party when you’re far away. He can link the music from his iPhone playlists to the mood lights in the living room. The invigorating blue you use to concentrate will turn in romantic reddish when the pace of the music slows down. As a novice chef, your son will want to impress his friends and it is good to have an oven that can do the cooking for him. With a built-in tablet, users can search for step-by-step cooking instructions for their meals in realtime. What’s more, your son can remotely control the oven from his smart phone, adjusting bake times or temperatures on-the-fly when another friend calls in and they decide to take a swim before eating. With leak detection in the bathroom, gas detection in the kitchen, and smoke detectors in every room, you know your property and expensive interior and equipment to be protected from the risks of costly damage. When a water leak is detected, not only could an alarm be sent, but it could also turn off the water supply to the house to prevent additional damage and text you a contact list of nearby plumbers who are open and available right now. The next morning, the cleaning lady cannot get in because your son will not hear the bell. Your home security system with connected doorlocks will allow you to open the door from your mobile phone’s app, just when you’re having your breakfast thousand miles away from home. However, when the cleaning lady sees the mess your son’s party has caused, she refuses to clean up and returns. Your son will have to take care of cleaning up himself and can switch on the robot vacuum cleaner with its dust awareness sensors as his best friend in the after party cleaning battle. Great, but how does this work in real life? As we do now, putting intelligence in single devices and sensors – all with their own smart phone app – is unsustainable and misses the bigger picture. You will need one dashboard application that integrates all individual apps and links their functionality in one convenient platform. You do not want to scroll through fifty different apps to monitor your home.The same occupancy sensor for the burglar alarm will be used in the light control application and climate customization of each room when nobody ispresent. Also, by using sensors on the windows, not only can an alarm be sent if a window is broken or opened, but a signal is also sent to turn off the heating or air conditioning to that room to prevent energy loss. 3) Cable and Internet service operators, capable of defining products (business/service models) including making installation easy/infra-structure are already in place to make money on the roll out. The challenge of the Smart Home, the house of the future is not the vision- it is the implementation of the intermediate steps needed to get us there. Currently, Operators are rolling out ZigBee RF remote controls and ZigBee security services that fulfill these three requirements – and creating intermediate steps towards the real Smart Home that we all wish we can live in. In the near future, we will be able to leave on a holiday and let the kids stay home alone, safe and secure. Our home will be as aware as we want to be – providing the eyes and ears to know what is going on as well as the long arms to make the needed changes and corrections. Elly Schietse oversees and directs marketing operations, customer relations and quality control for GreenPeak worldwide. The grid has gotten smarter over the last few years, but it has not captured the imagination of mainstream consumers. Why? It’s because most people can’t figure out how the smart grid improves their daily lives. For example, smart meters were supposed to lower people’s energy bills by giving people feedback. But a frequently held belief is that they make your utility bill go up. Most people don’t love the smart grid. In contrast, the smartphone is now the most popular consumer electronics device, with higher market share than ordinary dumb phones in the U.S. People love smartphones and use them constantly throughout their day. I personally get awakened every morning by my iPhone alarm, quickly check my email by phone as the fog clears my brain, check my calendar on my phone before I start my day, and frequently use a GPS app to navigate me to the right place for a meeting, all before making a phone call. And I’m sure many people do the same things. Smartphones have been incorporated into the daily habits of people. Smart homes to the rescue? Now finally, the smart home market is poised to take off. According to Transparency Market Research, the global home automation market is estimated to grow from $17 billion in 2011 to $47 billion in 2018. But smart homes have been discussed for decades and success is not guaranteed. I believe many of the solutions being offered today will fail, because they are overpriced and overly complex, under-featured and underwhelming. And they are closed systems, not centered on the computers we all carry around in our pockets and pocketbooks. To see the smart home market really triple in size, we need solutions that people fall in love with and use every day. From our reports store: “Smart Grid Business 2012 to 2017,” published by Memoori, analyzes the smart grid market’s size, technologies, finance and needed investments, demand forecasts and more. At People Power, we just launched a free App called Presence, which turns your spare iPhone or iPad into a Wi-Fi video camera with built-in motion detection. So you can turn it into a security camera, KidCam, PetCam, BabyCam or ElderlyCam, and view it from anywhere or get video alerts when something happens. We’re now getting thousands of downloads every day from users in 100+ countries, even though we’ve spent no money on marketing and launched less than two months ago. That’s because Presence helps people stay connected with the people and things they love most, no matter where they are. We plan to expand Presence to also control thermostats and smart plugs, read electricity meters and connect with a wide range of super cool devices through the People Power Cloud Platform, which is open to all hardware and software developers. With the White House push to make electricity data broadly available to everyone via Green Button, smart homes can be more connected to the smart grid than ever before. Together we can make solutions that bring the significant benefits of the smart grid to every smart home, that become part of people’s daily habits by making a positive impact in their daily lives. The problem with the proverbial Home of the Future is that it’s usually just that: A dreamy concept that we’ll all live in some day, but that’s just too expensive and, well, conceptual to be practical today. But on Thursday, Vivint, one of the biggest names in home automation systems, and Garbett Homes, a Salt Lake City-based property developer with more than 3,500 homes to its credit, unveiled a new smart home that boasts an energy rating of net zero. Dubbed the Zero Home, this house is so efficient that all the energy it needs is produced on site using renewable sources. This is no mere concept. The Zero Home is finished and will be on the market soon—complete with a charging station in its garage for your electric car. The kicker is that this house didn’t cost a penny more to build than a conventional home would have. The Zero Home is the first in Climate Zone 5 to be certified for net zero energy consumption. The Zero Home is certainly no shack: It’s a split-level, single-family home with five bedrooms, 3.5 bathrooms, and a four-car garage. It’s expected to sell for around $400,000, a price the companies describe as within the reach of an upper middle-class family. The Zero Home generates all the energy that it consumes. Buyers won’t need to take Garbett Homes’ or Vivint’s word for the home’s energy efficiency: It’s been independently certified by the International Code Council. The organization publishes a building code known as the International Energy Conservation Code (IECC), which divides the United States into eight climate zones. Most homes in Climate Zone 5 rely on a furnace for heating in the winter, and an air conditioner for cooling in the summer. According to Vivint and Garbett, the typical utility bill for a home in Herriman, Utah, where the Zero Home is built, is about $300 per month. The Zero Home does have a furnace and air conditioner, but because the house is so energy efficient, those systems are expected to be needed only three to five days each year. The rest of the time they’ll operate in standby mode, leaving the homeowner with a monthly utility bill near zero. The Zero Home has also been designated a U.S. Department of Energy Challenge Home, an EPA Indoor Air Plus Home, and an EPA Energy Star home. Its energy-efficiency and indoor air-quality gains spring from a combination of new construction materials, improved building practices, and high-tech infrastructure components: roof-mounted solar panels, tankless water heaters, a new type of HVAC (heating, ventilation, and air conditioning) system, and a host of Energy Star appliances. As the builder, Garbett Homes contributed the design and construction expertise. Vivint’s contributions include the 40 solar panels that generate the 10 kilowatts of electrical power the home needs. The home also features the home security and control system that Vivint is best known for today. Vivint has designed an all-new touchscreen control panel that includes real-time energy analytics. The homeowner will be able to see just how much energy the house is generating and consuming at any moment in time. Vivint also deployed a new 50-mbps wireless Internet service that the company is developing. 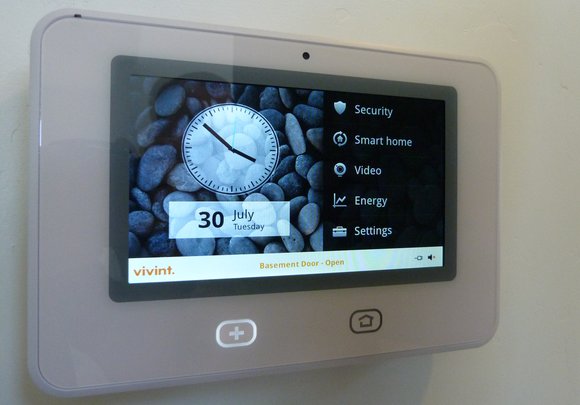 Vivint’s new control panel delivers real-time energy analytics. We only scratched the surface of what these companies have accomplished in Utah in this story. Read this follow-up for a much deeper dive into the Zero Home.